Evidence is an imperative for everything we do at the World Bank Group (WBG). Our internal reforms four years ago that created “global practices” acknowledged and incorporated the opportunity that drawing on state-of-the-art global knowledge represents for improving health and development outcomes. Our overarching goal for the Health Nutrition and Population Global Practice is to assist countries in accelerating progress towards Universal Health Coverage (UHC)—which means ensuring that all people are able to access the quality health services they need at an affordable price. As expectations for good health and health care converge globally, there is a growing global movement and momentum as part of the Sustainable Development Goals to achieve UHC by 2030.1 Evidence plays a role in a number of critical domains in supporting each country’s journey towards UHC. First, in too many countries there is a dangerous view of health as a consumption sector that is a burden on the economy. This view was also predominant at the World Bank, until the landmark World Development Report (WDR) of 1993 entitled “Investing in Health” made the compelling case to consider health as an investment.2 On the 20th anniversary of the 1993 WDR, a Lancet Commission on Investing in Health provided further evidence of the return on investment in health.3 It found that across low- and middle-income countries as a whole, health contributed to annual growth in full income by 1.8% per year in the period 2000–2011.4 Despite this compelling evidence, residual undervaluation of investments in health and education – or human capital – is widespread. This has led the World Bank to develop new composite measures of human capital, combining health and education outcomes that can be used to measure country progress and compare performance (World Bank-World Development Report 2018, forthcoming). Having made the case for investing in UHC, it is important to generate baseline measurements on the level of UHC. 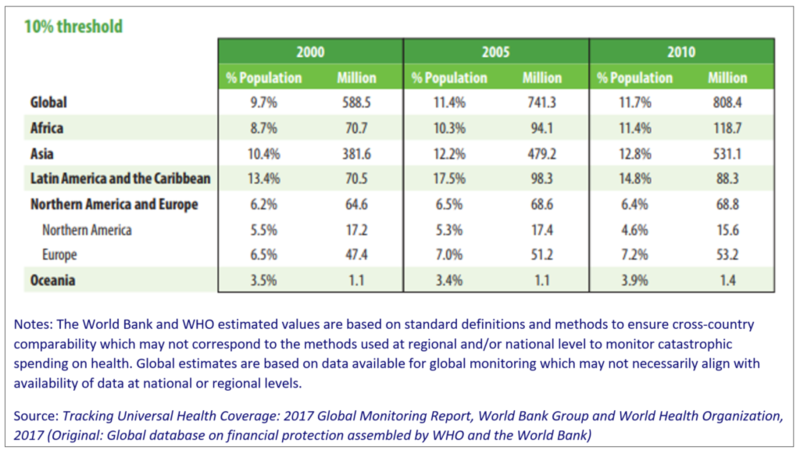 Together with the World Health Organization (WHO), the World Bank Group developed a measure of UHC that permits monitoring of progress across countries and over time. 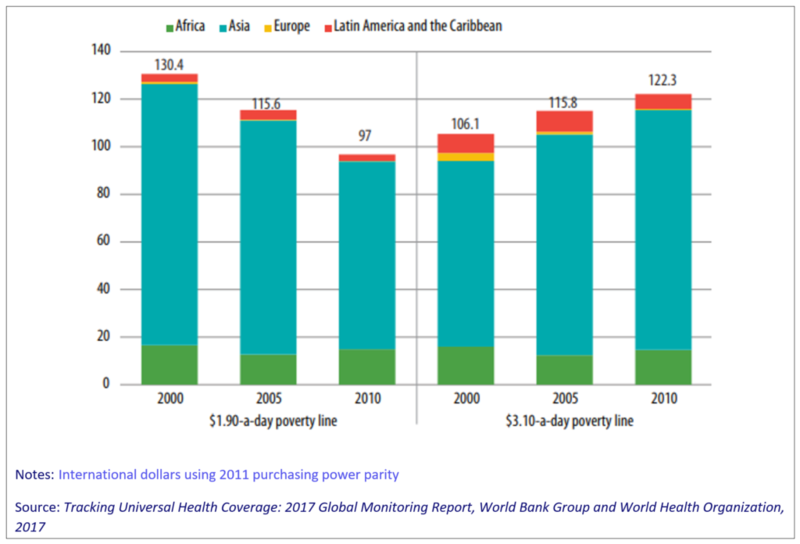 The World Bank-WHO Global Monitoring Report issued in December 2017 reported the sobering reality that more than half of the world’s population still lacks access to quality health services.5 One hundred million people are pushed into extreme poverty every year because of out-of-pocket health expenses, and 800 million spend at least 10 percent of their household budget on health – often forcing them to choose between healthcare and other necessities (see Figure 1 & Table 1). Further evidence is critical to framing more precisely the nature of the UHC challenge in each country. The performance at the front-lines of health systems is in many respects defining of UHC, yet comprehensive measures are lacking. The WBG together with partners from the Primary Health Care Performance Initiative are developing a primary health care performance index which will use a variety of internationally comparable data sources to summarize performance on three key domains -- access to care, quality of care, and effective coverage of essential services.6 Results for a group of fifteen trailblazer countries will be released later this year. The focus of UHC reforms must draw on evidence of the best value-for-money interventions. In Sudan, for example, using all available data and modeling, our research showed that the country could improve health outcomes by 37% without spending any more money on health through greater efficiency — and the country then incorporated the findings into its health program.10,11 Belarus and Georgia have also had a similar experience. Without evidence and data brought together in a dynamic way, this would not have been possible. On the flip side of the best value for money coin, there is plenty about the wasteful and inefficient use of scarce resources in health systems.12 This has been estimated to be as much as 40 percent of health expenditure.13 This inefficiency not only impedes progress towards UHC, but at its worst also causes needless loss of life. The political imperative to move forward quickly with UHC reforms raises the premium on gathering evidence on the effectiveness of implementation. The World Bank’s Universal Health Coverage Study Series (UNICO) has examined the experience of countries in implementing UHC reforms, and is a rich database of their experiences as well as a synthesis of key lessons learned in implementation. The lessons can sometimes be surprising. In Afghanistan, a 2018 World Bank report found that despite the widespread and longstanding insecurity in the country, there have been sustained improvements in health outcomes since 2003, especially for women and children.16 This evidence of health sector resilience is raising important insights on the (unexpected) benefits of Afghanistan’s contracting of health provisions to non-governmental organizations (NGOs) that may have implications for service delivery models in other countries with similar conditions of insecurity (see Figure 4). Evidence can also help determine if a strategy is leading to its intended results or has unintended consequences. A World Bank impact evaluation of Argentina’s Plan Nacer, the country’s health coverage program for uninsured pregnant women and children under the age of six, showed that the program had large positive effects on birth outcomes, including a significant decrease in low birth weight and in-hospital deaths of babies in the first 28 days of life.17 Plan Nacer uses a pay for performance model that provides incentives to the provinces and health care centers to promote better access and quality of health services. The evaluation provided concrete evidence that results-based financing approaches can have a significant impact on health outcomes and on the quality, provision, and utilization of health services. Driving progress towards UHC underpins all of our work on health. As we scale up our efforts to support countries around the world as they reform their health systems, we are more mindful than ever about the importance of investing in evidence to guide our efforts. The Global Goals. 2015. https://www.globalgoals.org/. Accessed May 10, 2018. World Bank. World Development Report 1993: Investing in Health. New York: Oxford University Press; 1993. https://openknowledge.worldbank.org/handle/10986/5976. Accessed May 10, 2018. Policy brief #2: the returns to investing in health. Global Health 2035. http://globalhealth2035.org/sites/default/files/policy-briefs/policy-brief-2-english.pdf. Accessed May 10, 2018. Primary Health Care Performance Initiative. https://phcperformanceinitiative.org/. Accessed May 10, 2018. World Bank. 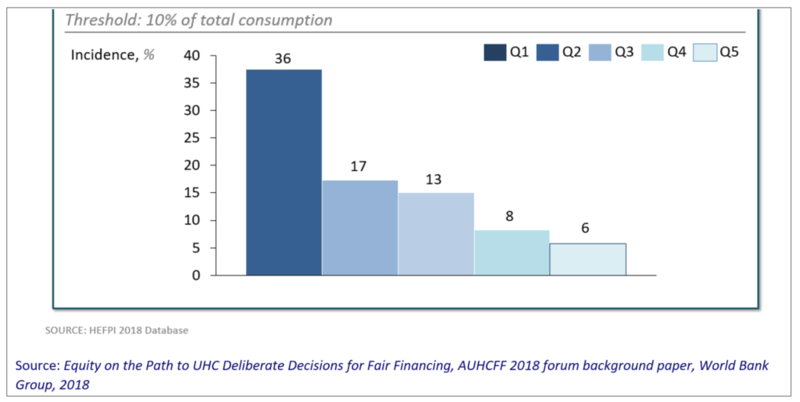 Equity on the path to UHC – deliberate decisions for fair financing. Background Report (Conference Version). 2018. http://pubdocs.worldbank.org/en/588321524060370166/BGP-v-8-20180418-0930-FINAL.pdf. Accessed May 10, 2018. World Bank. Health equity and financial protection indicators (HEFPI). http://datatopics.worldbank.org/health-equity-and-financial-protection/. Accessed May 16, 2018. Fraser N, Benedikt C, Obst M, et al. Sudan's HIV response: value for money in a low-level HIV epidemic. Washington, DC: World Bank; 2014. https://openknowledge.worldbank.org/handle/10986/21104. Accessed May 10, 2018. World Bank. A case study on how allocative efficiency analysis supported by mathematical modelling changed HIV investment in Sudan. From analysis to action., Washington, DC: World Bank; 2015. https://openknowledge.worldbank.org/handle/10986/24989. Accessed May 10, 2018. Organisation for Economic Co-operation and Development. Tackling wasteful spending on health. 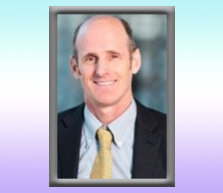 Paris: OECD Publishing; 2017. http://www.oecd.org/health/tackling-wasteful-spending-on-health-9789264266414-en.htm. Accessed May 10, 2018. World Health Organization. Health systems financing: the path to universal coverage. 2010. http://www.who.int/whr/2010/en/. Accessed May 10, 2018. World Bank Group. Progress in the face of insecurity: improving health outcomes in Afghanistan. Washington, DC: World Bank; 2018. https://openknowledge.worldbank.org/handle/10986/29420. Accessed May 10, 2018. World Bank Group. Argentina’s Plan Nacer: delivering results for mothers and their children. 2013. http://www.worldbank.org/en/topic/health/brief/argentinas-plan-nacer-delivering-results-for-mothers-and-their-children. Accessed May 10, 2018. Harman L, Bastagli F, Hagen-Zanker J, Sturge G, Barca V. Cash transfers: what does the evidence say? London: Overseas Development Institute; 2016. https://www.odi.org/sites/odi.org.uk/files/resource-documents/10747.pdf. Accessed May 10, 2018. Filmer DP, Friedman J, Kandpal E, Onishi J. General equilibrium effects of targeted cash transfers : nutrition impacts on non-beneficiary children. Policy Research working paper; no. WPS 8377. Washington, DC: World Bank Group; 2018. http://documents.worldbank.org/curated/en/989031522077749796/General-equilibrium-effects-of-targeted-cash-transfers-nutrition-impacts-on-non-beneficiary-children?cid=DEC_PolicyResearchEN_D_INT. Accessed May 10, 2018.